In a large frying pan over medium heat, warm the olive oil. Add the onion and garlic and cook, stirring often, until the onion is soft and translucent, 5 – 8 minutes. Stir in the tomatoes, oregano, salt, and pepper to taste and simmer until slightly thickened, 5 – 8 minutes longer. Pour about half of the tomato mixture into a 2-qt baking dish. Arrange the shrimp over the tomatoes and scatter the cheese over the shrimp.Spoon the remaining tomato mixture over the top and spread evenly. 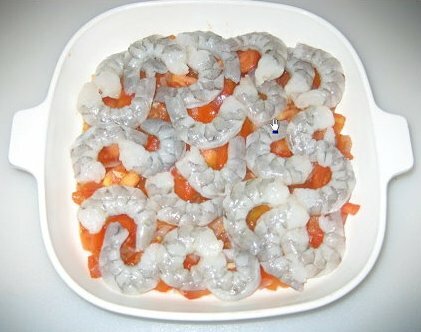 Bake until the shrimp are opaque throughout but still tender when tested with a knife, about 20 minutes. Sprinkle with the parsley and serve at once, directly from the dish. Serves 4 to 6.